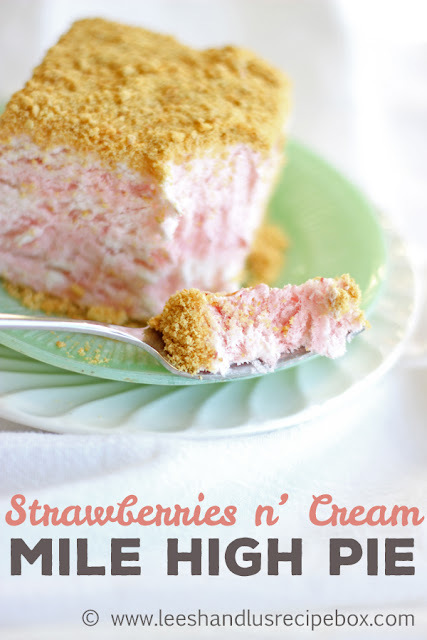 My birthday was a few weeks ago and since I'm not a huge cake lover (except for carrot cake and a few other over the top cakes) I usually go for cheesecake or my other favorite, Strawberries & Cream Mile High Pie. 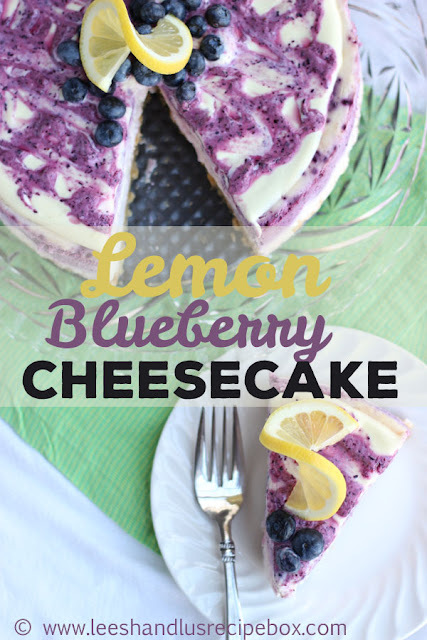 This year I changed up my favorite lemon cheesecake (the one I had the previous 2 years) to be lemon blueberry (one of my all time favorite flavor combos). Oh man, it tasted even better than it looks. And I loved the vibrant purple color next to the lemon, the colors were beautiful. 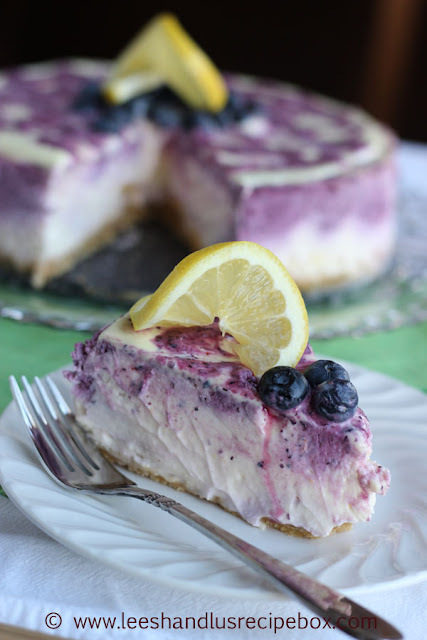 My favorite thing about this cheesecake recipe is how light it is. If you've made many baked cheesecakes before you know that it's mostly made of cream cheese. This cheesecake has just as much sour cream as cream cheese, making the texture so very "melt in your mouth"....oh my goodness, it's divine. I do love classic NY cheesecake, but I'd take this version hands down any day if I had the choice between the two. Can we just talk a little bit about my love for blueberries? They are so pretty and delicious! When ever I use them in a recipe I go a little crazy taking pictures of them. This pictures just does my heart good! My husband needs to receive all the credit for this beautiful cheesecake, because he made it just for my birthday (love that man). I just stole a little of the filling and topping while he was mixing it up and blended in some blueberries and swirled it around. The result was just what I had been dreaming of, it doesn't always work out that way, but when it does, it's pretty much the best! 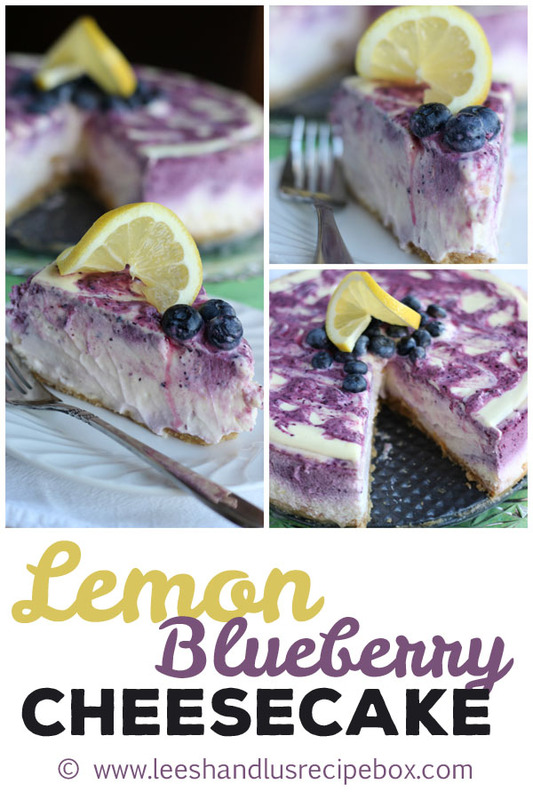 The color and flavor of the blueberries was a perfect addition to my favorite flavor, lemon! 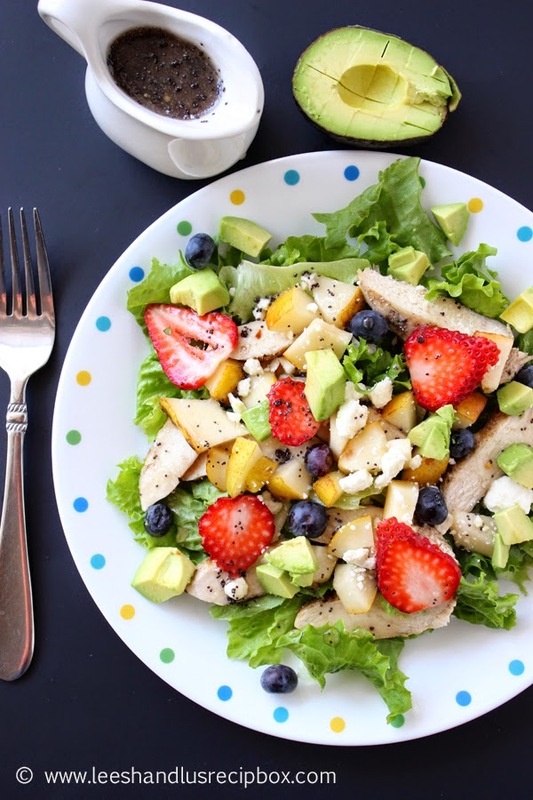 This cheesecake looks so "springy" and fresh. 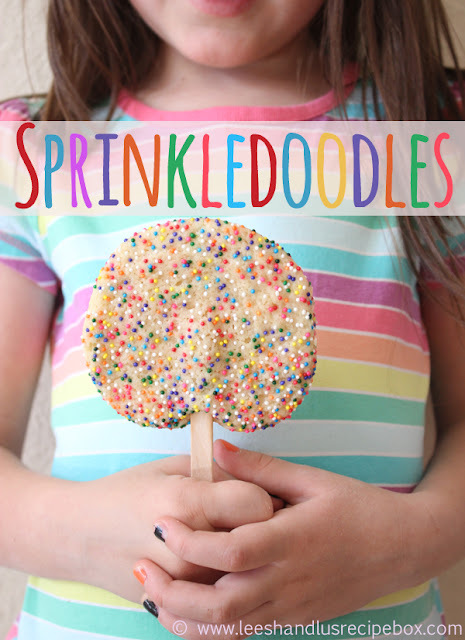 Perfect for Easter dessert (or anytime during the spring or summer time). I hope you'll enjoy this as much as we did. We savored every bite! I hope you'll enjoy the loads of pictures, I couldn't help myself. I took way more than what I've shared in this post, but it was so pretty I had to share some of my very favorites! PS. 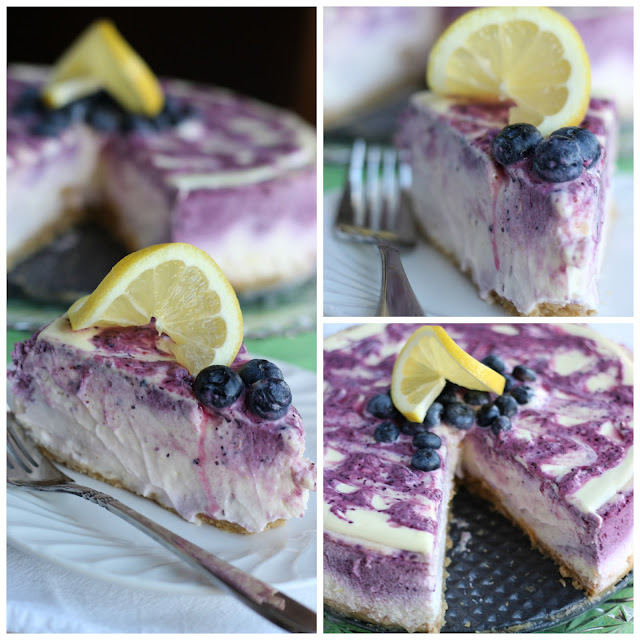 I wrote very detailed instructions for making this cheesecake, it's not hard, I just wanted to share all that I could to make sure your cheesecake turns out just as amazing! *If you’d rather do a graham cracker crust follow this: 1 ½ cups graham crackers, crushed, 3 tablespoons granulated sugar, 6 tablespoons butter, melted - combine cracker crumbs and sugar and stir until incorporated, add the melted butter and mix until the texture is uniform. Press the mixture into the bottom of a 9 inch springform pan. *Full fat cream cheese and sour cream will result in a much better texture and flavor of cheesecake. 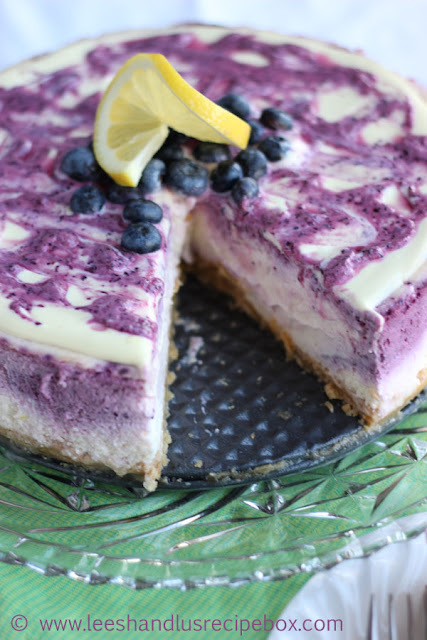 *There is a light blueberry flavor in this cheesecake. Blueberries have a lot of natural occurring pectin in them and adding too many I thought would ruin the texture of the cheesecake. But it makes for a gorgeous color and light blueberry flavor. If you want to do the golden Oreo crust, start by placing about 24 Oreos in the food processor) or in a large gallon ziplock back. Crush the cookies in the food processor or use a rolling pin to crush them in the bag until you have crumbs. 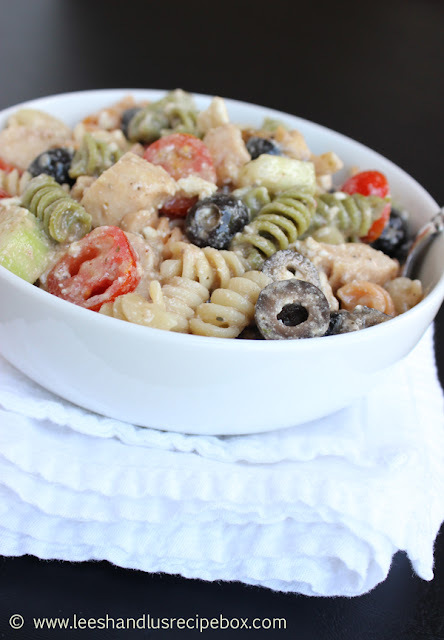 Mix in a small bowl with the melted butter. Press into the bottom of a 9 inch springform pan If you prefer the graham cracker crust, see notes in the NOTES section. In a large bowl (or bowl of stand mixer) beat (with electric mixer or stand mixer) the cream cheese until smooth, scraping the bowl as needed, making sure to get all the lumps out of the cream cheese. Add the eggs one at time, mixing each one in as you go. Add the sugar, salt, vanilla and lemon extract and mix until smooth. Add the sour cream and mix til smooth. Add the lemon zest, lemon juice, and beat until light and fluffy and combined, scraping the sides of the bowl as needed. Scrape the sides and bottom of the bowl to make sure no cream cheese is stuck to the bottom, if it is, beat again until there are no remaining lumps. 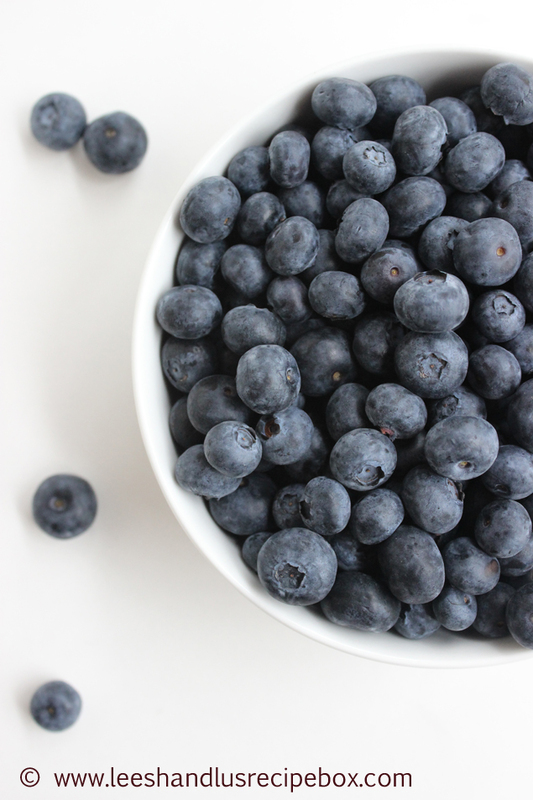 Remove 1 cup of the filling into a liquid 2 cup measuring bowl (or blender jar) and add the 3 ounces of blueberries. 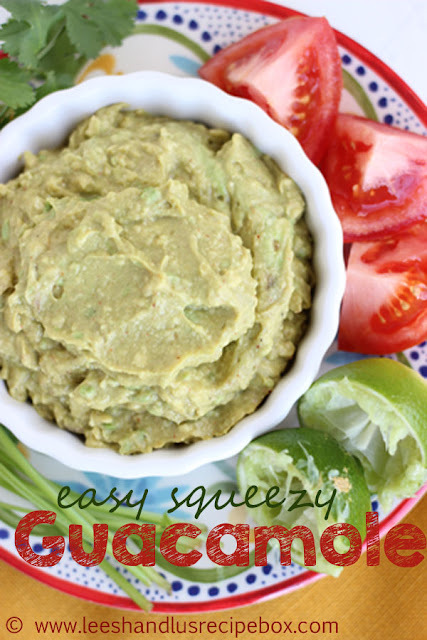 Blend with a stick blender or in the blender jar until smooth. This cheesecake bakes in a water bath, so covering the pan in foil or with a crock pot liner helps the cheesecake not to leak out and the water not to leak in (we don’t want a soggy crust). Most springform pans are not leak proof. Place heavy duty foil or crock pot bag around the bottom of the springform pan so that it wraps several inches up the side. If you can, try to only use one piece of foil so that there won’t be any leaking. If you need to use two pieces make sure you fold them back several times to get a tight seal. Pour half of the remaining lemon filling into the pan on top of the crust. Dollop ½ of the 1 cup of blueberry filling by the spoonful on to of the lemon filling. 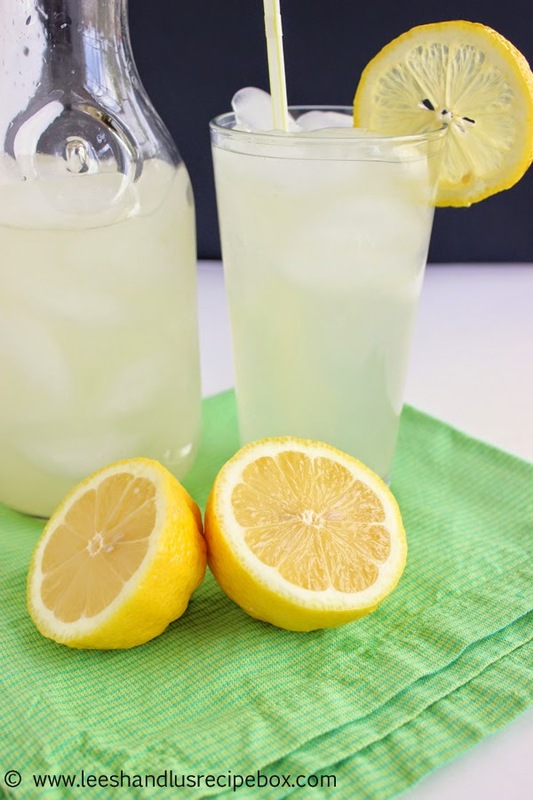 Pour the remaining lemon filling on top. Dollop with the last ½ cup of blueberry filling. Using a thin spatula or butter knife cut through the dollops making a swirly design in the cheesecake, don’t over do it. 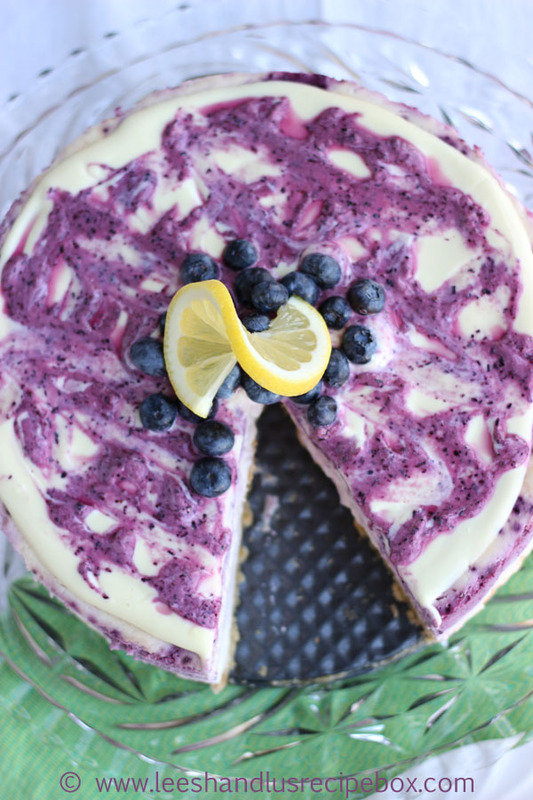 You want swirls of lemon and lemon blueberry. Place a larger baking or roasting pan in the oven with the springform pan on it. Use a pitcher or measuring cup to pour water into the large pan/roasting pan (so that it goes ½ way up the sides of the springform pan). Bake in the preheated oven for 35-60 minutes or until the center is firm, but jiggly (like set up jello). When it’s reached that point, turn the oven off and crack the door open a few inches and let the cheesecake cool until you can handle the pan (1-2 hours). Remove the springform pan from the water bath and allow it to cool completely on a flat cooling rack. Once completely cool wrap in foil or plastic wrap and refrigerate overnight (or at least 8 hours). When you’re ready to serve, carefully remove the sides of the springform pan. And then make the topping. In a small bowl and using a wire whisk, whisk the ¼ cup sour cream, ¼ sweetened condensed milk, and 1 ½ tablespoons of lemon juice. Spread ⅔ of the mixture over the top of the cheesecake. 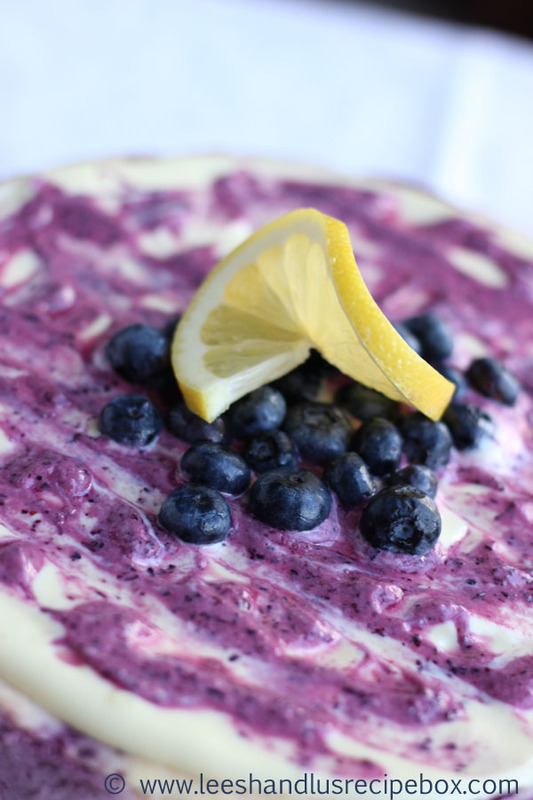 With the remaining ⅓ of the topping - add the few tablespoons of blueberries and blend until smooth. Place small dollops of the lemon blueberry topping around the top of and use a thin spatula to swirl them around, taking care to not swirl too much, you want there to be lemon and blueberry spots for a pretty look. Top the cheesecake with a handful of blueberries if desired and a lemon wedge if desired. Slice and enjoy! This takes a while but it looks like it is definitely worth it. I also love blueberries! And it turned out so pretty in your pictures. I can't wait to try it.